In the picture above, north is at the top and the image covers 88.3 x 110.4 degrees. Image centre is located at 03:20:21.0, -23:25:01 (H:M:S, D:M:S, J2000) Astrometric data from Astrometry.net. Eridanus (the Celestial River) is very well named, since it winds its way over an enormous area of the sky. It is the 6th largest constellation (almost 1140 square degrees) and wanders over a huge range of Declination. The river runs from close to the celestial equator (which runs through Orion's Belt) to its brightest star Achernar (α Eri, from the Arabic for 'river's end'), which is at 57° south declination. According to Wikipedia the Chinese name for this star means 'first star of the crooked running water', so more than one culture has recognised the sinuous watercourse. While the constellation's dimensions are impressive, it is difficult to trace it across the sky, so the Greek (and perhaps Chinese) makers of the constellations or their predecessors had a keen eye and a vivid imagination. The names of the main named stars, Achernar (α Eri), and Acamar, (θ Eri) are sufficiently similar to raise some questions, and in classical times Acamar, on the southern edge of Fornax was indeed the end of the celestial river, being close to the southern limit of what was visible from ancient Greece. The river may have been the river Po in Italy, perhaps the Nile or even the twin rivers of Mesopotamia, the Tigris and Euphrates. 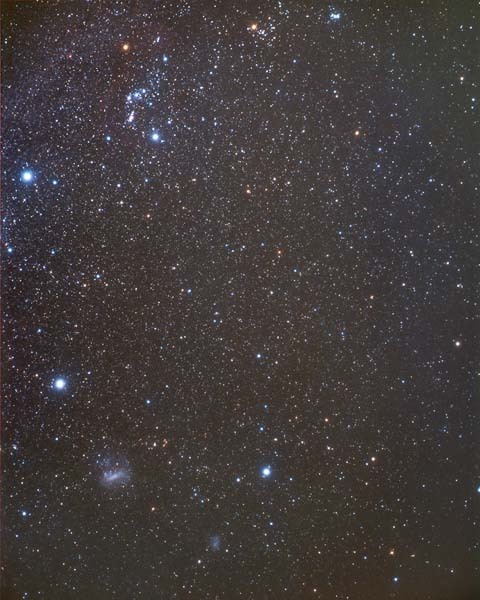 The above photograph is a very wide field of view, and the constellation boundaries have been adjusted to match the distortions in the image. Acamar	(θ 1Eri), Achernar (α Eri), Angetenar (τ 2 Eri), Azha	(η Eri), Beid	(ο 1 Eri), Cursa	(β Eri), Keid	(ο 2 Eri), Rana	(δ Eri), Sceptrum (53 Eri) Theemim (υ 2 Eri), Zaurak	(γ Eri), Zibal	(ζ 2 Eri).